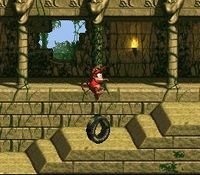 This stage utilizes a trick called a Super Jump, which stores the jump that the Kongs make to the top of the screen when they die near a wall. There is no difficult input required for this trick. Simply follow what you see in the video. Let go of b once donkey is off screen. Diddy is sacrificed as the warp barrel only appears for Donkey Kong. Cut your jump over the Krusha as close as possible without breaking the barrel, and turn right just before hitting him. You will need to follow the All Stages route, then return to this stage to enter all of the bonuses. The last bonus utilizes the Bonus Skip trick. To do the Bonus Skip, you will need to pause and exit the stage after opening the bonus, but before walking into it. If Diddy is in the air during the throwing animation and you hear the bonus sound, you paused on the correct frame.